If you’re a tinkerer and like to really squeeze efficiency from your machines, you can get a lot of mileage from installing Linux on a Chromebook. It provides greater control over your system and access to an array of useful applications that aren’t available in Chrome OS yet. Thankfully, we’ve done the hard work of learning how to install Linux on a Chromebook, and broken it down into the steps below. 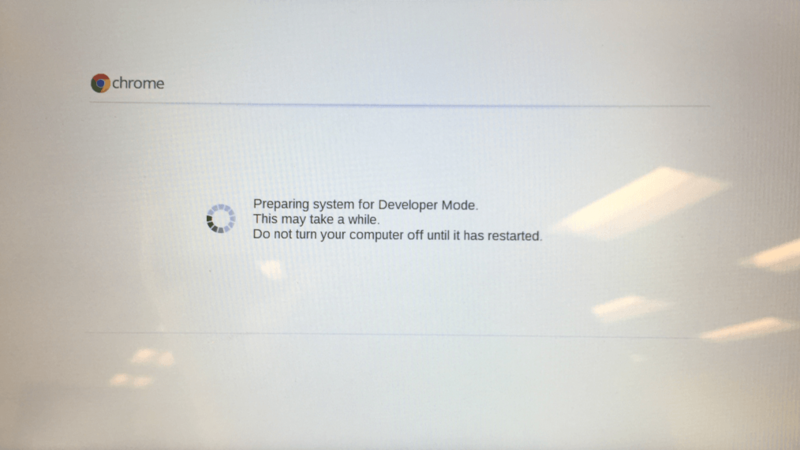 Note: Switching your Chromebook over to developer mode may void your software or hardware warranty, so make sure to check with your manufacturer before getting started. A restored image will take your system back to a brand-new state, but you never know what the manufacturer might see if you have to send it in for repairs. If that isn’t an appealing option, or you aren’t feeling adventurous, you can also install Android apps on your Chromebook to add functionality without upsetting the manufacturer. Those with more ambition can even install Windows on a Chromebook, but the process is far more complicated. Either way, read on for further details. Step 1: Back up your junk! One of the best features of Chrome OS is that a lot of your data is saved to Google Drive, rather than locally. It’s especially convenient for you right now, because step two is going to erase all of the local data on your Chromebook. If you have any files you don’t want to lose, back them up to the cloud, or to another computer, for the time being. Zipping up groups of files can help you put them back where they’re meant to be after the installation. You’ll also want to be prepared with a recovery image, just in case something goes wrong. You can download software directly from Google that makes this process easy, and then all you need is a flash drive or SD card, depending on your Chromebook’s connectivity. Now that you backed up all of your data and are ready to wipe your system completely and start over — don’t worry, it will automatically install Chrome OS — you can put your system into developer mode. There used to be a complicated series of hidden switches for this, but it’s now part of the Chrome OS firmware and it couldn’t be easier. With your device on, hold down the Escape and Refresh keys, then press the power button. When your Chromebook turns back on, you’ll be in recovery mode, with the screen telling you to insert a recovery disc. You’ll come back here if something goes wrong, but for now, hold CTRL and press the “D” key to bring up the OS verification menu. You have two options here, the first being that you can hit the spacebar to wuss out, remove yourself from the menu, and pretend you never wanted Linux to begin with. The second option is to hit the Enter key, which will delete all of the local data on your Chromebook and boot you into developer mode. After a few moments, it will let you know that you’re now in developer mode, and then reboot the system to a fresh install of Chrome OS. Fill out all of your information like you normally would, and continue until you’re looking at the Chrome OS desktop. Dealing with Linux kernels and shell scripts can be intimidating and messy if you aren’t familiar with Unix, but that’s OK because David Schneider, a hardware engineer at Google, has made it relatively painless. 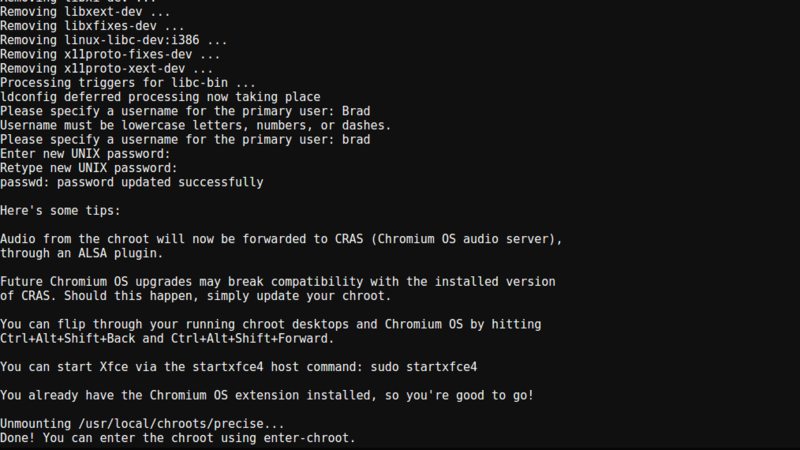 Through a bundle of scripts he calls Crouton — an acronym for ChRomium Os Universal chrooT envirONment… sort of — all you have to do is use one command with a few parameters to get Linux up and running. 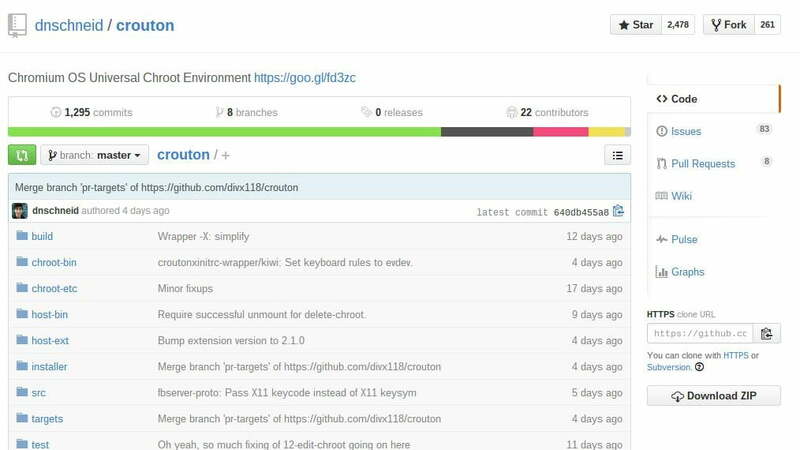 The Crouton GitHub page features a download link for the software, as well as detailed instructions, troubleshooting tips, and forums that discuss issues and tricks for making everything run smoothly. Download the Crouton file, which should automatically save to your Downloads folder. If you want some added functionality, like a unified clipboard between Chrome OS and Linux, you can also install the Crouton Clipboard extension, but it isn’t necessary. 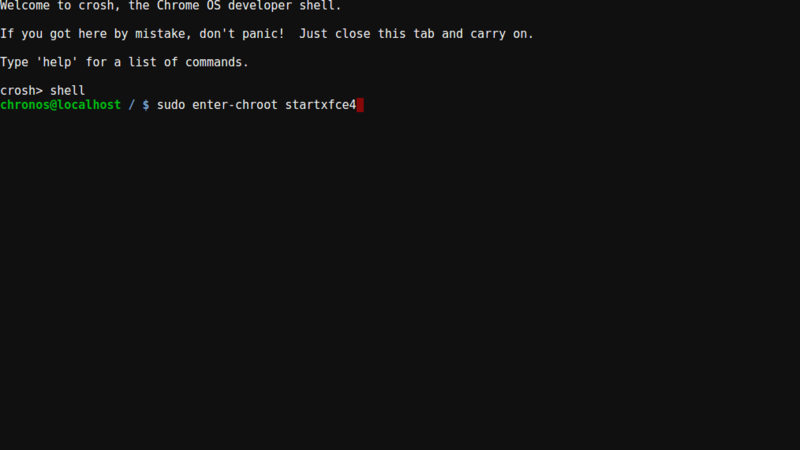 You might not know it, but Chrome actually has a terminal of its own, called crosh (ChRome OS developer Shell), that gives you access to settings that aren’t normally available, and lets you control files and programs in much the same way you would a Linux shell. The easiest way to access the terminal is to hold the CTRL and ALT keys, then press “T,” which will open a Chrome window or tab with some text and a place to enter commands. 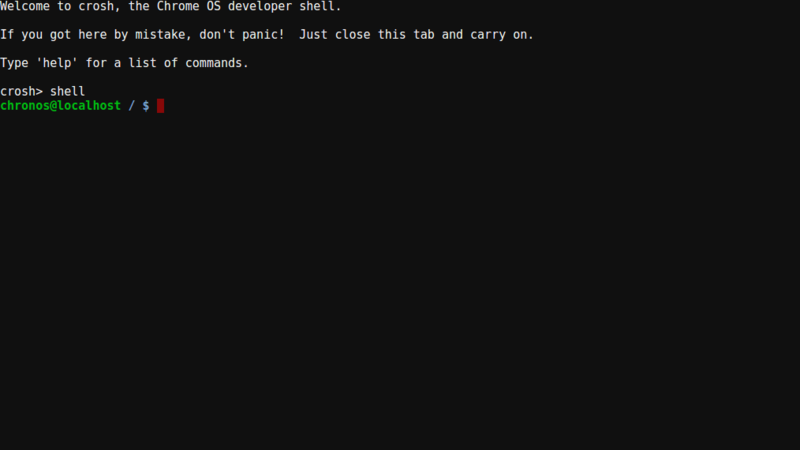 Once you have this window open, type in “shell” without quotation marks to enter the true UNIX command line, where we’ll access the core at the center of your Chromebook and Chrome OS. It’s from this command line that we’ll run Crouton, the program that will download and install any of a number of Linux distributions. For this guide we chose XFCE, namely because it’s lightweight and functional, which is perfect for preserving the long battery life and portability of a Chromebook. Step 5: Where’d my icons go? Paste the following command into your command line: “sudo sh ~/Downloads/crouton -t xfce”. If you installed the aforementioned Chrome extension, you’ll also want to change the command so it says “xfce,extension” at the end. Hit Enter and wait as your system pulls the necessary information and begins setting up your chroot. Don’t be surprised if this takes a bit of time, or if you see lots of text on the command line. More importantly, don’t interfere with this process. If you’ve ever installed an operating system before, you know that it needs time to itself to unpack data and configure system files, but it needs your input from time to time. A Linux installation is no different, so you’ll have to respond to a few prompts during the setup process. If you used the most basic installation option, it will just ask you for a username (lowercase letters, numbers, and dashes) and a password. Before you go and type in the same password as your Gmail account or the one you use for every other site, it’s important to note that your whole system, not just the Linux half, is protected by that password, so if someone guesses it and gets into the Linux shell, they have the potential to access your Google account and its data. You should choose a strong password regardless. Type it in again to confirm — Note: The cursor doesn’t move when you enter a password in Unix — and hit Enter to finish installation. Your secondary operating system is now installed! 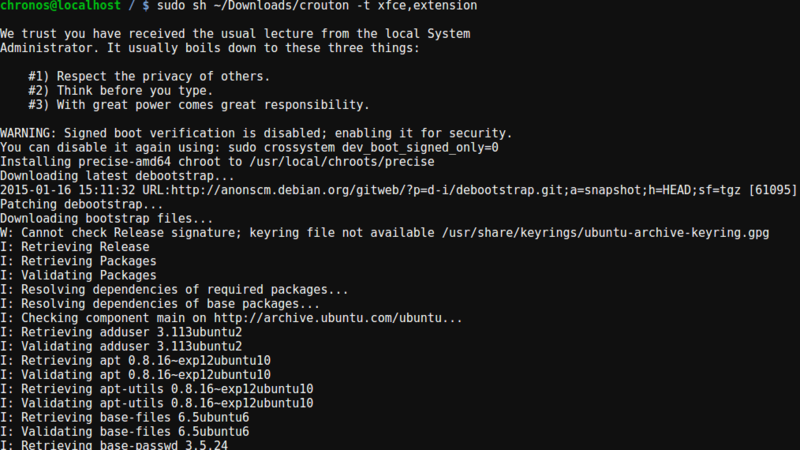 To access it, simply return to the shell — where it should have deposited you after install — and enter the following command: “sudo enter-chroot startxfce4”. The screen will then go black for a minute and boot into the Linux desktop. If you aren’t familiar with Linux, keep in mind that it takes a bit more effort than Windows or MacOS, especially the first time you boot it up. There are lots of advantages to installing Linux on your system, but there are a few that are particularly relevant to Chrome OS users. The following programs provide functionality that your Chromebook can handle but don’t fall within the Chrome OS ecosystem, or provide functionality you wouldn’t have if you were using your Chromebook offline. Steam: Valve’s digital storefront and its surrounding community are awesome, and, thankfully, you can use your Chromebook to play whatever games in your library natively support Linux. If you have a desktop machine somewhere in your house that you usually use to play games, you can also play those games on your Chromebook. Simply log into Steam with the same account on both your Chromebook and your desktop to set up the connection, which will render games and stream the video output over your local network. VLC: When it comes to media players it’s hard to beat VideoLAN Client, which supports dozens of audio and video formats, as well as a bevy of useful features for network streaming and playback. It couldn’t be easier to install — it even comes packaged with some larger distributions — and is open-source, if you want to try your hand at compiling the software yourself. GIMP: Chromebooks don’t have a real version of Photoshop to run, though, browser-based options like Pixlr serve as basic alternatives. If you need something a little more robust, the Gnu Image Manipulation Project (GIMP) is a free piece of image-editing software that provides a large number of tools typically reserved for competing software. Moreover, the active user base is constantly working to help solve problems and develop new tools and features. Skype: Because Chromebooks are easy to take with you on the go, Skype is a great choice for staying in touch. Most modern laptops have webcams and microphones built in, too, so you can videochat from anywhere you have an internet connection. If you can’t convince your friends to switch to Google Hangouts, at least you’ll have another option for managing your long-distance relationships and web friends. Updated 7/28/2017: Minor edits to copy.